Ireland’s first lady of comedy Maeve Higgins sat down with Riley to chat about adventures in The Big Apple and her spectacular new laugh-out-loud book Off You Go: Away From Home and Loving It. Sort of. The comedy industry is no joke, pun very much intended, and no one knows this better than Maeve Higgins. It is undoubtedly one of the most difficult careers for anyone to try to make a name for themselves in. Cork’s own Higgins defied the odds and is on her to becoming a household name, not only in Ireland but across the world. With her own television show behind her, Maeve Higgins was on her way to becoming Ireland’s answer to Kim Kardashian. Well, not really but they both make us laugh for different reasons. While Maeve acted on Naked Camera her counterpart Kim just got naked on camera. A big part of Off You Go is about travel and taking yourself out of your comfort zone. And that’s just what Higgins has done. Packing her things and leaving the humble island of Cobh behind her, she set out to take over the world, or at least Dublin for the time being. It was here she spent years honing her comedic ability, by performing at open-mic nights and comedy clubs until she made the move to London. Although, in the new book Higgins claims that she just couldn’t embrace London. However lonely London was, Higgins stands by her belief that travel is a huge benefit to any budding comedian. The book documents the fact that travel has a way of waking you up a bit. Unlike mean old London, the Big Apple embraced the Cork comedian with open arms and she finally found her home away from home. The American Dream is sought by many but obtained by few, but Higgins was one of those few lucky enough to make it in New York with the big leagues. But the good times didn’t stop rolling for Higgins there. The chance soon arose for her to work with the hottest comedian in the world, the one and only Amy Schumer. Higgins worked with Schumer on her hit Comedy Central skit show Inside Amy Schumer in the sketch Doggy Daycare. The two and a half minute clip was also posted online, gaining over one million views. The scene included three women standing behind a viewing glass as they sent their dogs off to doggy daycare. “There were real dogs on set, there were anorexic dogs and dogs in wheelchairs, so yeah it was a really fun and easy job, it was great craic”. 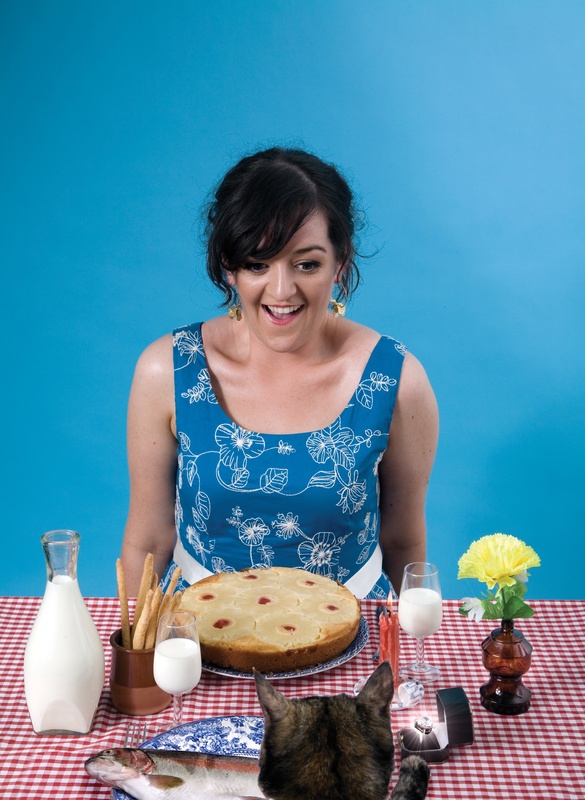 Like any tortured artist Maeve Higgins loves to be alone. Maybe that was a bit dramatic but she really does love to be alone. In one of the many witty misadventures discussed in her new book, she tells the readers about the time she decided to move to an island in the middle of nowhere when the move to London turned out to be a disappointment. In the particularly hilarious account, Higgins recounts her trip to Bere Island. While, from the outside, comedy is often seemingly an industry of fun and games, our conversation soon turned to the darker areas of making people laugh; namely the apparent prevalence of mental illness amongst comedians. Higgins recalls how she looked at a study last year which claimed that comedians are prone to psychosis and that “some people who are artistic, part of their process is looking inwards and thinking about things and it can get pretty dark so maybe that’s why writers have a side to them that can be prone to melancholy. I don’t think it’s essential like you don’t necessarily have to be a crying clown and I don’t think you have to feel sad to make good art…but it helps [laughs]”. Off You Go shows Irish humour making it across the globe and comes highly recommended. It’s is a tale of an ordinary girl trying to achieve something extraordinary, and Maeve Higgins does just that. Maeve Higgins’ Off You Go is probably the funniest book on the market right now and can be found in all good bookshops.